Losing one or more teeth changes your life in several ways. The most notable change is in your smile’s appearance, which is why one of the most appealing aspects of modern dental prostheses is their ability to closely mimic healthy, natural teeth. However, there are several other, more impactful consequences of tooth loss that can take years to become noticeable. At our El Paso, TX, dental office, we often recommend replacing lost teeth with an appropriate number of dental implant posts. With their ability to replace the roots of your lost teeth as well as their visible crowns, dental implants can help restore or improve your quality of life following tooth loss. What’s different about dental implants? Dental implant posts are small, root-like anchors that are gently inserted into the jawbone. Each implant is made from biocompatible titanium so that your jawbone can fuse to them as it heals, and is placed precisely to maximize the amount of support it can provide dental prosthesis. Depending on how many teeth you’ve lost, you can receive a custom-designed dental crown, bridge, or denture supported by an appropriate number of carefully placed dental implant posts. In addition to the root-like anchors, your prosthesis will also be crafted from highly lifelike porcelain to replicate the natural appearance of your smile. One of the most immediately noticeable benefits of dental implants is the comfortable, stable support they offer your prosthesis. Instead of relying on additional measures like hidden clasps or adhesives, dental implants give your replacement teeth the same anchored support that your healthy, natural teeth enjoy. 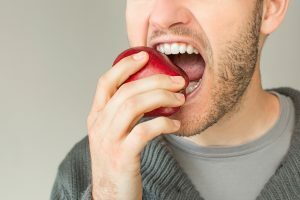 This also another important and unique benefit – the reestablishment of stimulation in your jawbone, which it relies on to remain strong and healthy. This particular benefit means that your jawbone doesn’t suffer from the loss of your natural teeth roots, reducing your risks of losing more teeth due to a weakened jawbone. Together, the improved stability and long-term benefits of dental implants make them the ideal solution for many tooth loss patients. However, their realism and ability to restore functions that your oral structures rely on create several additional, equally important benefits. For instance, because your prosthesis is anchored in place, you won’t have to worry about your bridge or denture slipping because it’s lost its original grip. You can also bite, chew, and speak more comfortably knowing your prosthesis won’t move as you do so. Dental implants give your smile more than a just a better-looking smile; they also improve your oral health by restoring the vital functions of your lost teeth roots. For more information, schedule an appointment by calling the Sunny Smiles dental office nearest you in El Paso, TX, today! We also have offices in Chaparral, Canutillo, and Vinton so we can easily serve patients throughout all surrounding communities.